Lazada Philippines is an online shop that offers a wide variety of products. It provides a worry-free shipping online shopping experience to its customers. Oh, that's the impression they want to imply to their customers, to give an hassle-free - EFFORTLESS Online SHOPPING experience. Most of the people are buying online to avoid the hassle of going out to the malls---to avoid the inconvenient long counter line and to look for the best item without wasting time. If I need something and I've seen it online, my basic instinct is to buy that product online. Yes, I am a busy person, so I turned to Lazada to shop. Actually, this is not my first online shop with them, I have been a constant customer of Lazada. The first transaction I have with them, is when I won a Discount Voucher worth PHp300 and need to use it, I bought 2 Android Tablets, and the second transaction is when I bought a REBECCA TOTE BAG. All my transactions turn positive. As humans, we prefer positive feedback instead of giving critiques, right? However, as we always say, we are all humans, and we commit mistakes. This time I need to rant all my disappointments with Lazada Philippines. I purchased KYOWA Burger and Pancake Maker last March 31, 2015 and payment thru PAYPAL. I waited for almost 2 weeks. Yesterday( April 13), I use the TRACK and TRACE LBC Tracking Page. And in my dismay, I found out that my order status was "RETURN TO ORIGIN", because of the reason I cannot understand. REFUSED TO ACCEPT ORDER???? How can I refuse my order? It is my order, why will I refuse it? 1-800-10-8585999 and talk with their Customer Service Representative. The CSR confirmed that my item was already in their warehouse, and she affirmed to me that they will RE-Deliver the item back to Davao as soon as possible within 24 or 48 hours. So, I was relieved with what I've heard. After a few hours, a friend message me, telling me to try contact the main LBC WAREHOUSE Branch-Sasa. I did not hesitate to call and talk with the assigned courier of my item. I ask him, how come my item is not delivered in my address? COURIER ANSWERED: (1) My mobile number indicated in the paper is wrong and out of reached. (2) No one knows me personally in my area. Our conversation is very short, but I am still shock with his reason. WHY? (1) I give LAZADA both my mobile number and Landline number to make sure that my item will be delivered. (2) How come no one knows me here in my barangay? I lived here for almost 38 years(since birth), and no one knows me???? Then the reason indicated in their tracking page is that I refused to accept my order???? Hahahaha...WHAT A BIG LIE!!! Then received an email from LAZADA that I have to re-order the said item. Because I don't want to be stressed, so I emailed back LAZADA that I will not continue my transaction with them, just REFUND my payment. I am seriously disappointed with LAZADA, especially that I have been buying from them for years. And if this is the kind of service they want to give to online shoppers, then I will not waste my time with them. (1) They did not give my other number to the courier. I have my account with Lazada, all the details are there, including my landline number. (2) Instead of delivering back my package, they want me to re-order the item. Which is upon checking their site the item is unavailable. And according to them, I have to wait and visit their site and check if the item is already available. A bit confusing scenario, how come unavailable? What about the item returned to their warehouse, which is my item. And asking me for re-order and to wait???? They used to be the number one ONLINE SHOPPING SITE that I love so much, but now they're the worst. Honestly, your new logo does not correspond to your service. EFFORTLESS???? Whew! Give me a break, it added more STRESS to your buyer. A piece of advice here, NEVER TRUST LAZADA. I suggest, it is better to shop in a mall and pick your product instead and SAVE yourself from STRESS! 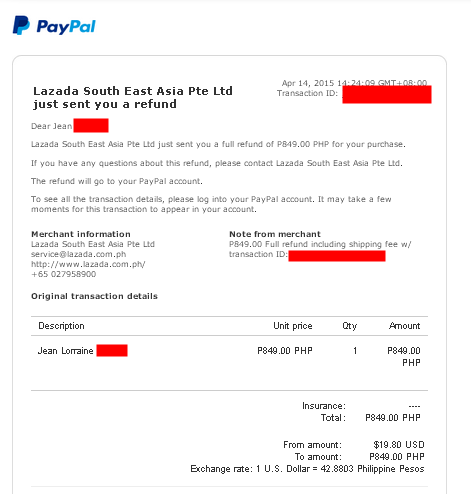 UPDATE: Paypal emailed me now, and I got my refund from Lazada. Well, thanks anyway. I have said my part already. Hope you will fixed everything, especially the system you have now. We don't like it! It was a messed up situation! That's too toxic. I hope they improve their system or totally take out the effortless part so they won't mislead. I had this experience last month lang! I bought a Valentino watch from them instead of buying at Zalora, of course gusto ko makatipid ng konti. So I saw Lazada selling Valentino watches. I bought it at March 23, together with a Belo Spray, because I don't want to pay the shipping fee, I just added another item to cover it. On that week, they processed the other item and it says that they already shipped it, after 2 days I got the Belo Spray. Then I started to wait last March 26th, onwards.. and dumaan ang Holy Week. I called them on April 1st, telling me naman na hinihintay parin nila yung item from the supplier and once they got it sa warehouse nila ipapadeliver, so I said okay. Natapos ang Holy Week, dumaan ang Monday. Gosh wala parin, then I called April 7th. Ang sabi sakin, nacancel na yung order ko, ang sabi ko dun sa babae, "wow kung hindi pa ko tatawag hindi ko pa malalaman." then told me na hindi na daw kasi available ung item and ieemail pa lang ako about the order. As in super nairita ako, then ipprocess na lang daw ung refund. I got the refund after 2 days. After the refund, biglang nag email ng cancellation of order, natawa ako sa second sentence..
As if tumawag sila sakin, e ako ang tumawag, edi wow. After I got the refund, yesterday I bought a Velocity watch for my boyfriend, and wow nakuha ko kaagad kanina. https://instagram.com/p/1cV2BPBRs7 at nakabox pa.
Whew! Sobrang dami n natin into, pissed off with Lazada's system. Magulo Silva now....wlang coordination. I had this frustrating experience as well. I have cancelled my order since it was COD. To my surprise, it was still delivered to me a few weeks after I cancelled it. Haven't ordered from them since then. Magulo nga talaga system nila sis. Ewan ko bakit ganito sila now. Oh, I'm sorry about your bad experience with them. I always go shopping online too because it's convenient. I live in the US and so far so good, I didn't experience anything like this. In the Philippines we are not or people are not used to shop online kaya cguro those who are starting pa lang are not organize at crocked pa system nila. I also heard sa ibang online store like ebay maraming hindi dumarating na merchandise sa mga customers. Anyway, buti nalang you got your refund from paypal. Hello Jonalyn. Usually, they deliver it. Make sure you give them your mobile number and landline number (just in case) they cannot locate your whereabouts. Thanks. Me from Cebu. Tatlong order ko na deliver, tatlong order ko naman ang ewan, baka napunta sa Marawi. Kakabweset ang lazada, di consistent yung service especially yang LBC courier na yan. Sorry to hear that sis...I'm sure somebody from Lazada will contact you and apologize. In my case, they did that but I don't accept it...I don't sign either dun sa letter n pina pasign s akin. This is another reason why I prefer shopping at www.goods.ph than lazada. mas maayos din ang customer service ng goods ph kaso kailangan lang nilang i-improve yung shipping nila kasi medyo matagal. This is mostly LBC's fault. They're undermanned or tamad lang sila mag deliver. 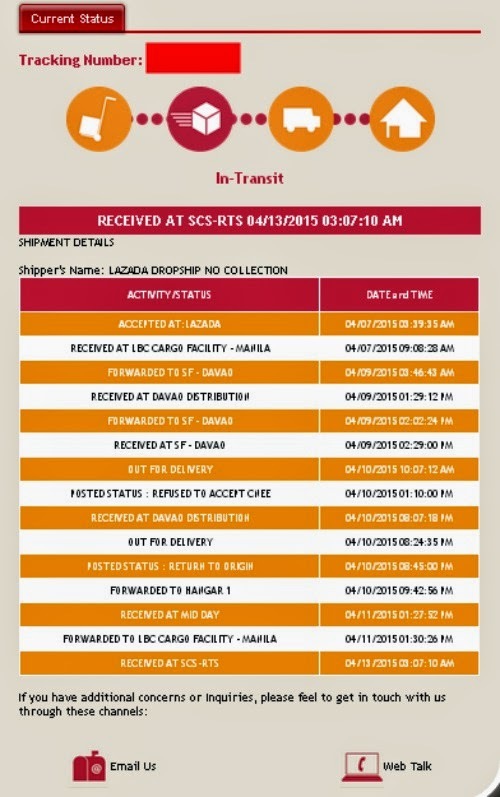 In 2015 I've had also several negative experiences of LBC delivering by Lazada items (very long stories). But to Lazada's credit, they have been made aware of this recurring problem and have been using LBC lesser now compared to 1-2 years ago. Nowadays, almost all of my Lazada deliveries are delivered by LEX. The past 150+ items delivered to me in Cebu have all been delivered by LEX. The last time LBC made a delivery to my Lazada order was once in November 2016.